MAULDIN, S.C. – Authorities say a hoverboard has exploded inside a home, causing a small fire but no injuries. The Mauldin Fire Department tells local media outlets one of the popular toys exploded inside a home Tuesday afternoon. Fire Department Lt. Christopher Walker says two teens at the home received hoverboards for Christmas. One teen had just finished charging his board when the batteries combusted and flew about 20 feet across the living room, lighting a chair on fire and burning the carpet. Officials say no one was injured, and Walker says the fire caused no structural damage to the home. 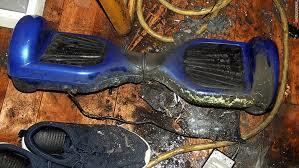 The Consumer Product Safety Commission says it has received dozens of reports of hoverboard-related injuries across the country and that agents are actively investigating fires caused by the boards. Incidents and injuries involving hoverboards are being reported around the country and some consumers are call for new laws to regulate them.